Bespoke Victorian mosaics direct to your door. Made to order and delivered as easy to lay film-faced sheets to ensure accurate and efficient installation. Choose from our Wide Selection Of Mosaic Designs and Borders. 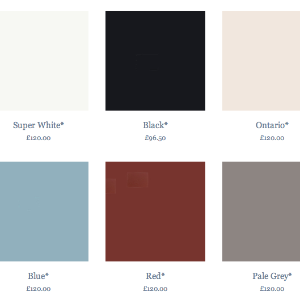 Browse our palette of standard and specialist colours or by colour range. Please call us on 01736 364877 or email us with your dimensions before you place your order online to ensure correct quantities of tiles are ordered - dimensions are tricky to calculate.